In MoneyWorks Cashbook and Express, you can protect the information in your document from casual prying eyes by giving the document a password. Note: MoneyWorks Gold and Datacentre have extensive security options so that user access can be limited to specific functions (e.g. Salespeople can only put in orders). These users should refer to Users and Privileges. Click the Show Typing check box if you want to be able to see what you are typing, otherwise the characters you type are not shown. 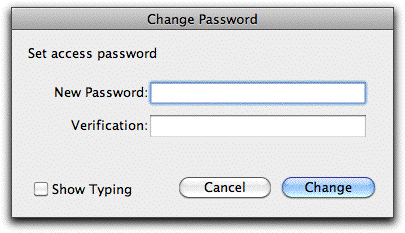 If the password you type in here is not identical to the one typed into the New Password field, the Change button will be dimmed. Note: Once you close the document, you will only be able to open it if you type in the password, so do not forget your password1.